As the seasons change, so does our energy. 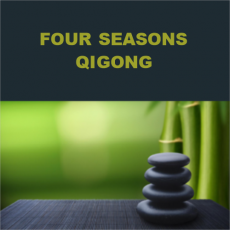 In this class we will study in depth the Four Seasons Qigong set (from the teachings of Dr. Yang, Jwing-Ming) which helps the body adjust to the changing seasons as well as clears out energy blockages in specific organ systems. This set has been practiced for hundreds of years to promote wellness and relieve pain. We will also practice deep meditation to move energy through the meridians of the body with the Micro Cosmic Orbit and Twelve Meridian Meditations. No prior experience needed. Registered students will have access to the recorded lessons from the Online version of this course and may join in on the live broadcasts on Tuesdays at 11:30 am. Access to the recorded lessons will be for one year after the completion of the course.